In a small village in India, Kavita is about to give birth. She is praying this second child with her husband, Jasu is a boy. If it is a girl, like her first born, she will not be able to bare the consequences. Sadly, this second child of theirs is a girl. Kavita will not allow what happened to their first daughter, happen to this one, so she makes the choice to give her away. This decision will haunt Kavita for the rest of her days. We are then taken to California and introduced to Somer and Krishnan. Somer and Krishnan are doctors and have tried everything to have a child, but finally decide to adopt. They travel to Krishnan’s home, Mumbai to visit an orphanage and bring home their baby. Somer, an American, hopes her love will be enough to overcome all the obstacles in their path. The story continues going back and forth between the two couples and their lives starting in the 1980’s and continuing all the way through 2009. The interconnecting lives of Kavita and Somer and their struggles with motherhood, with their marriages, and with their future will give you an emotional ride. The daughter that connects these two women across the world grows up as the reader travels through the book. As she becomes an adult, she struggles with the two worlds that she is part of, those of her father’s family in India and her mother’s family in America. By searching for where she fits in, she finds that maybe where she belonged was right in front of her all along. The author had no trouble placing me in the heart of the tiny village of India or in the large city of Mumbai. Her descriptions of the people living in the slums of Mumbai and their daily struggles were heartbreaking to read, but I’m sure all too real. The traditions of Krishnan’s family and Kavita’s family opened my eyes to a whole new way of living. I’m just thankful our American culture realizes it is the man that determines the gender of a baby and doesn’t value boys over girls. I wanted to scream at Jasu and his ignorance. This was our book club choice last month and was loved by all of us. As moms we found this book to be quite emotional as we read both Kavita’s and Somer’s struggles with giving up their child and with not being able to have childen. We sympathized as they raised their children and confronted frustrating moments. We empathized as their marriages weren’t as they originally dreamed they would be. This was a book full of feelings, relationships, traditions, and most of all, love. It is a story you won’t forget. This is Shilpi Somaya Gowda’s first novel and I can’t wait to read her next one. The novel is also planned to hit movie screens in the future. Shilpi Somaya Gowda was born and raised in Toronto to parents who migrated there from Mumbai. She holds an MBA from Stanford University, and a Bachelor’s Degree from the University of North Carolina at Chapel Hill. 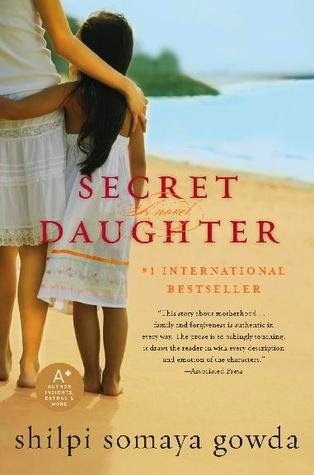 In 1991, she spent a summer as a volunteer in an Indian orphanage, which seeded the idea for her first novel,SECRET DAUGHTER. A native of Canada, she has lived in New York, North Carolina, and Texas. She currently makes her home in California with her husband and children. 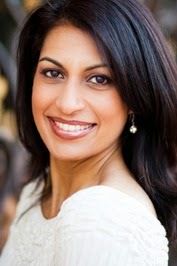 For more on Shilpi, check out her website, http://www.shilpigowda.com/. You can also find her on Facebook, HERE, and Twitter, HERE.